All has not been right in the iOS development community as of late. Although registered Apple developers are generally used to finding the official iOS and Mac Dev Center offline for small periods of time, the last three days has seen a total blackout from Apple’s side. Although most developers assumed that the Cupertino company were giving a visual overhaul to the Apple Developer website, an official email based correspondence from the fruit company has confirmed that the three day downtime has been due to a security breach that occurred on Thursday. There has been initial concerns that the email may have come from an untrusted source, but Apple has confirmed to various outlets, including us at Redmond Pie, that it is an official communication. It was Thursday of last week that the Dev Center went down without any warning, which in itself isn’t out of the ordinary. The time periods involved started to raise a few eyebrows and Apple has now issued a statement saying that they detected a malicious attempt on their servers, with the personal information of all registered developers being the target for the intruder. As part of the statement, Apple is keen to emphasize that all of the stored sensitive personal information, including CC details, is encrypted and cannot be accessed by any hacker who may get their hands on it through an attempt of this nature. With that said, the company has also made it clear that they cannot provide any assurances that some names and mailing addresses of some developers have not been accessed. As soon as the attempt was detected the developer portal was taken offline with the company working around the clock since to rectify the issue. It’s likely that developers will see continued disruption to the development portal as Apple put safeguards in place to ensure that this doesn’t happen again. The communication sent out to all registered developers states that all backend systems are being overhauled with the server software being updated and the entire developer database being rebuilt. 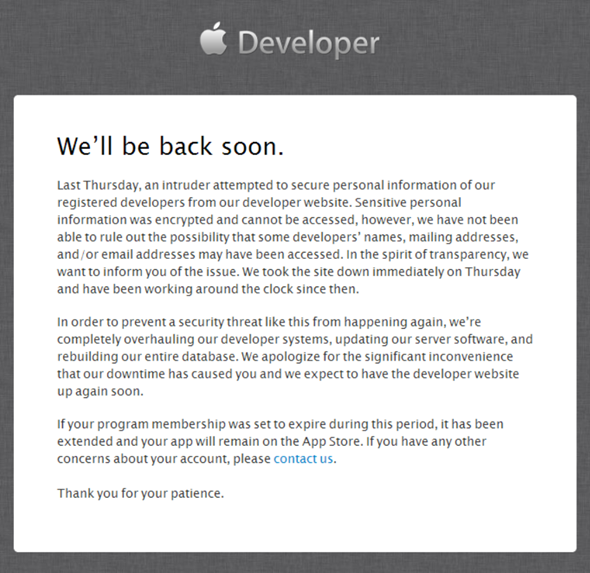 There’s no official word on when the developer site will be back up and running, but it’s at least a small amount of consolation that we know now why the site has been offline and that Apple are doing all they can to resolve the problems.